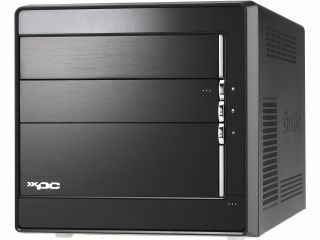 Shuttle today announced its latest high-end gaming computer, the Shuttle XPC Barebone SD39P2. Replacing the SD37P2, the Shuttle XPC Barebone SD39P2 supports Intel quad- and dual-core processors and runs on an Intel 975X/ICH7-R chipset. The SD39P2 is equipped with 8GB dual-channel DDR2 memory capable of processing 10.7Gbit/s. It supports both Nvidia's 7950GX2/8800GTX, and ATI's X1900XTX graphics cards, leaving customers to select their preference. The gaming machine comes with 2 PCI slots, one PCI-E X16 and one PCI 32-bit. It has 8-channel HD audio sounds, FireWire, seven USB ports, four SATAII ports and one eSATA port. Its measurements are 32.5 x 22 x 21cm (L x W x H). Shuttle could not confirm price or availability details at this stage.